Those with facial acne have a high risk for also having back acne, or bacne. We know clogged pores can form pimples, and your back skin pores are much different than the ones found on your face. We will look at the varying causes of acne on back and how to treat outbreaks with back acne home remedies. Unfortunately, there is not one direct cause of acne to treat. The breakout of pimples can be exacerbated by conditions affecting the skin pores. Did you know more than 60% of people suffering with acne have bacne? This is because the pores on the back are larger, thicker, and more active than facial pores, and therefore, contain more sebum-producing glands. These glands are thought to be responsible for an acne outbreak, as excess oil clogs the pores. Along with over-active oil production, there are other factors that can clog pores. As bacne is caused by a number of factors, there are ways to treat and prevent outbreaks based on your lifestyle and daily activities. In addition to prevention and lifestyle changes during a bacne outbreak, there are home remedies you can try. Some of the tips focus on how to get rid of back acne in a week. Baking soda is one of the most powerful tools and the fastest way to unclog pores and get rid of back acne. It is known for balancing the pH levels and preventing future breakouts of bacne due to its antifungal, antiseptic, and antibacterial properties. A word of caution, use it in small amounts and only when needed. Add three to four teaspoons of baking soda to a few drops of water to create a paste. Apply it to the affected area, and leave it on for two to three minutes before rinsing off with cold water. Pat the skin dry, do not rub. As with baking soda, apple cider vinegar balances the pH level of the skin. It also has antibacterial and anti-inflammatory components to combat outbreaks. Mix one tablespoon of the vinegar with one cup of water, and apply it to the acne. Leave it on for 10 minutes before rinsing it off with warm water. Repeat two to three times a day, until the outbreak is cleared. You can also drink one teaspoon of the apple cider vinegar with raw honey in a glass of warm water. Have this concoction two times a day. By using the essential oil properties of tea tree oil, you can expect bacne breakouts to heal quickly. It has anti-inflammatory and antiseptic components to reduce inflammation and redness, while drying out excess oil from pores. If you have sensitive skin, it is recommended to dilute it with water before use. Apply a cotton ball soaked in one to two drops of the oil directly on the acne. After 15 to 20 minutes, rinse the oil off with warm water. Use this treatment once a day. Another direct remedy is combining four to five drops of tea tree oil with one teaspoon of honey, and applying it for 15 minutes before rinsing. Add honey to your skin care regime to prevent breakouts and heal active symptoms. It has antibiotic and antibacterial properties to maintain hydration and healthy skin cells. Use it alone by applying it directly on the affected area for 10 to 15 minutes before removing it with warm water. Do this two to three times daily. You can also use one tablespoon of honey with half a teaspoon of cinnamon powder to create a paste for a 10-minute bacne treatment. Rinse with warm water and repeat daily. The powerful properties of turmeric include antibacterial and anti-inflammatory components to combat the P. acnes bacteria, as well as pain and inflammation. It can help balance the skin’s pH level as well. Mix one to two teaspoons of turmeric powder and sesame oil, and apply the paste on the bacne for a one-hour period before removing it with warm water. You can repeat this treatment one to two times daily. You can also ingest this remedy by drinking a glass of warmed milk mixed with half a teaspoon of turmeric powder. Drink this concoction twice a day. The gel of the aloe vera plant has vitamins, minerals, antioxidants, and amino acids that can help treat and prevent the bacteria and inflammation of bacne. You can apply the gel directly on the affected back region twice a day. Another treatment using aloe vera gel is to mix one tablespoon with half a teaspoon of raw honey and turmeric powder to form a paste for the acne. Rinse it off after 15 to 20 minutes, and repeat daily. Unclog pores by removing dead skin cells and harmful bacteria with the natural healing powers of a lemon. It contains L-ascorbic acid that should not be used on sensitive skin. Cut a lemon in half and apply it directly on the bacne for a 10-minute treatment. Rinse it off with cool water, and repeat one to two times each day. You can also combine equal amounts of rose water and the freshly squeezed juice of a lemon for a treatment. Apply this on the affected area, and leave it on for 20 to 25 minutes before rinsing. Do this twice a day. Green tea is known for its bacteria and inflammation-fighting properties. Brew a cup of green tea, and using a quarter cup of the tea, mix it with a quarter cup of water to soak a cotton ball. Dab the mixture on the bacne, and leave it on for 10 minutes before rinsing. Repeat twice a day. Alleviate pain and itchiness that can accompany bacne with the soothing sensation of oatmeal. It will combat the breakout by unclogging pores and get rid of excess oil. Apply a paste of one tablespoon of oatmeal and water to the bacne. Leave it on for 10 minutes before rinsing it off with warm water. Only repeat once or twice a week. Dry up the excess oil and bacne sores with the salicylic acid-containing tomato. It will also help with any inflammation and pain of the affected areas. For a topical application, slice a tomato and massage it on the area for a few minutes. Leave it on for 10 minutes before removing it with warm water. Do this process twice a day. You can also combine one tablespoon of tomato juice, half a teaspoon of raw honey, and a few drops of pure lemon juice. Use this mixture directly on the bacne with a cotton ball. Rinse with warm water after five to 10 minutes. Repeat this treatment once a day for three days. 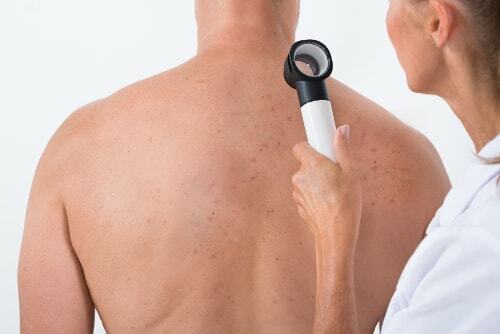 Back acne, also known as bacne, is a common problem for those suffering from facial acne. The glands on our back produce more sebum due to the larger size of the pores. It is important to treat bacne to avoid infection, further complications, and spreading of the acne. You can safely treat cases with home remedies, and by following several lifestyle tips. Prevent future outbreaks by maintaining good skin care. “Back and Body Acne,” Acne; http://www.acne.org/body-acne.html, last accessed March 29, 2017. McCoy, K., “How to Treat Back Acne,” Everyday Health, February 17, 2010; http://www.everydayhealth.com/acne/back-acne-treatment.aspx, last accessed March 29, 2017. “How To Get Rid of Back Acne Fast,” Top 10 Home Remedies; http://www.top10homeremedies.com/how-to/get-rid-back-acne-fast.html, last accessed March 29, 2017. “11 Simple Remedies to Get Rid of Back Acne Fast,” Natural Remedy Ideas; http://naturalremedyideas.com/back-acne/, last accessed March 29, 2017.